they say that opposites attract. (they meaning society, cliches, take your pick). but i’d like to beg to differ. i had some hallmates i used to hang out with at the beginning of my freshman year, but over time, i came to find that we just weren’t that similar. there was a time where i basically had to drag them out of the hall to get donuts with me. who’s not down for donuts??? (aside from if you’re gluten free, at which point you are exempt and i am down to get an acai bowl with you like the basic california girl that i am). and then when we got to the donut place, they 1) got the same thing and 2) weren’t down to share with me. no wonder that i, a food obsessed person, did not last in friendshipial bliss with these otherwise nice humans. i’m not saying that i want to be friends with my carbon copies. no, then we’d snipe at each other and enable the other to buy and consume way too much food. i’m saying that there needs to be threads of commonality that run deeper than a mutual interest in a trashy mtv reality dating show (what can i say, i was bored my freshman year). pasta, cauliflower, pecans and feta are all fairly agreeable ingredients. they go with a lot of things, and aren’t opposite of many things. 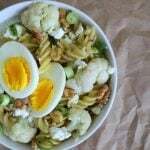 so, this weeknight cauliflower pasta with pecans and feta works. the crunchy, toasty nuts mingle with the chewy pasta. the salty, creamy feta goes with the assertive scallion and vinegar, which also goes with the sweet, tender cauliflower and onion. harmonious? i think YES. This weeknight cauliflower pasta with pecans and feta is, as the name suggests, perfect for a weeknight. It's quick and easy and cozy, just the thing you want to devour a bowlful of after a long day. Heat some oil in a large pan over medium heat. Add the cauliflower. When the cauliflower begins to soften, add the onion and garlic. Saute until the vegetables are crisp-tender. Add vinegar and lemon juice to taste. Add the pasta, then add enough extra-virgin olive oil to coat the pasta thoroughly. 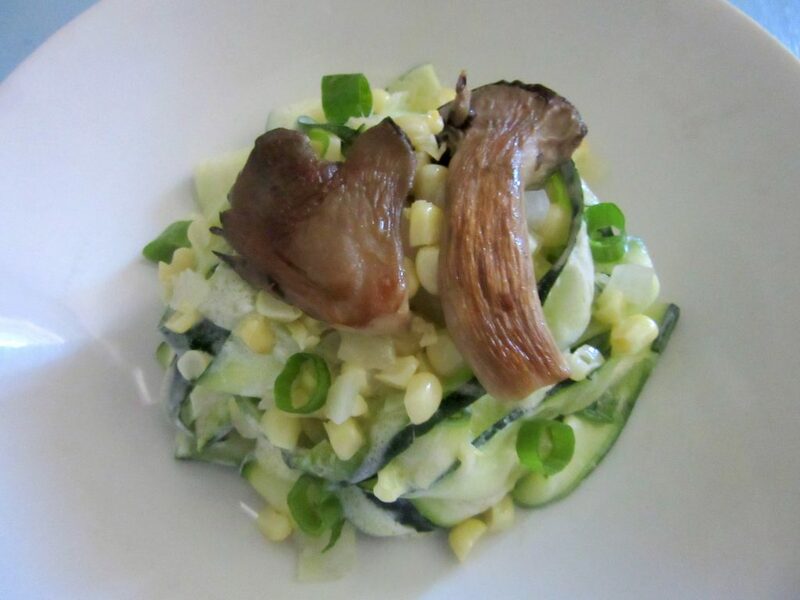 Toss and serve with the nuts, cheese and scallions on top. From Alice Waters’ Chez Panisse Vegetables. Should you want some more protein, might I suggest an egg? I like hard-boiled or fried. Chickpeas (or other beans) or chicken (or other protein) also work well here. Calorie information does not include to taste quantities. Cauliflower is one of my favorite veggies, so this pasta looks awesome! Have a great week, Heather! Heather, this combination sounds amazing! These are not ingredients I would think of combining. I’m glad they at least are enjoying some “friendshipial bliss” – great term, BTW! Looks super delicious! I literally can’t wait to try it!! Wow, this sounds tasty. I’ve been trying to branch out from my regular roster of recipes (I can def get in a brussels sprout rut at this time of year) so this is a good one to try, it includes so many things I love! Everything in this looks amazing!! And I agree, on the outside opposites can attract (for example my dad-tatto covered, Mom-your typical gal next door) But on the inside they have the same morals and life goals. You need that common ground. Food does as well. As much as I love donuts, I don’t want it mixed with my steak! i wouldn’t be surprised if steaks were mixed with donuts. there’s a place near me that does a pesto, ham and egg doughnut, and i’ve seen donut burgers floating around on the internet. but i’m with you; i want steak separated from donuts! I don’t know if I could be friends with someone who wouldn’t share their food with me, haha – how else are you supposed to try a bunch of different things!? This is a brilliant veggie meal Heather! That looks pretty heavenly to me! 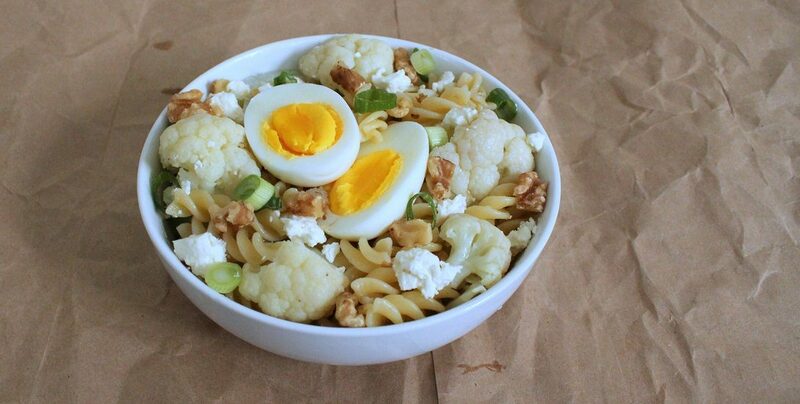 I love eggs and cauliflower together! thanks, gigi! tbh i love eggs with anything vegetable lol. i’m convinced that pasta and feta make anything savory better! (actually though: i add feta to almost all of my salads lol). Haha! I have to admit that trashy tv is always a good time on occasion…especially is said trashy tv is accompanied by donuts. Because donuts make everything better! (I’d even bet donuts would make an acai bowl better…is that sacrilege?) Love this combo of flavors you’ve got going on here, Heather! Sounds like a delicious meal to me! hmm, i love donuts and acai bowls, so while i’m not sure how it would work, i would probably be down to taste it anyways (; my dad has this philosophy that frying anything makes it better, which sounds like your donut proclamation! I’ll get donuts with you! 🙂 This pasta sounds wonderful with all the lovely flavours and textures mingling together. Love cauliflower and feta especially! 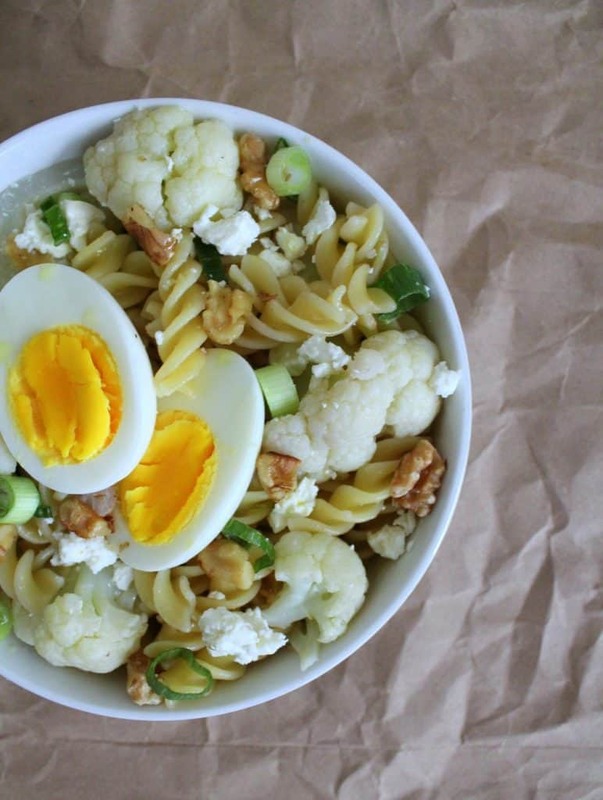 Consider me down for this healthy, delicious cauliflower pasta dish, Heather! And yes on the hard boiled egg. Make mine with a little bit of salt and way too much black pepper! Oh the fun of college days 😀 That pasta sounds really good and I love that you add such different flavor combination. 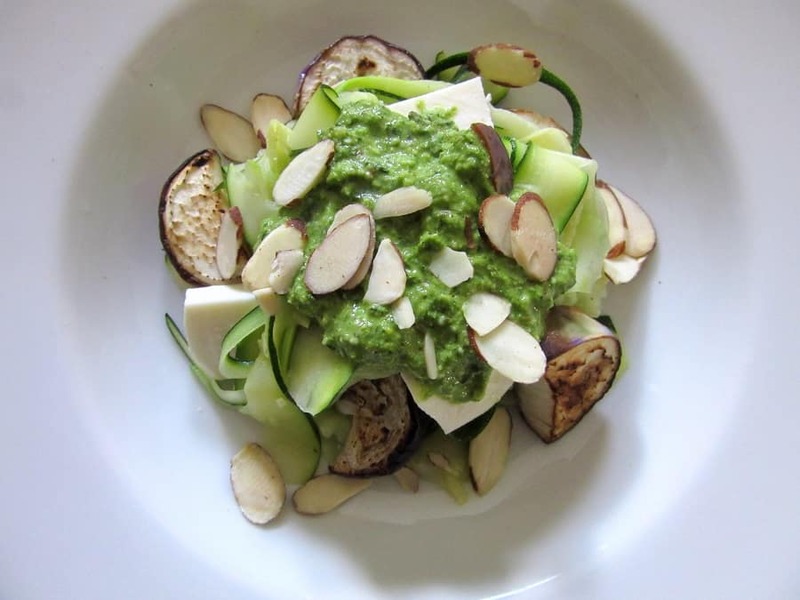 This is a very nutrient-dense and mouth-watering recipe, Heather! Excellent choice for a quick lunch! My friends need to share food with me! This is basic principle. I would never have thought to put these ingredients together Heather and I like all of them. thanks for sharing! YUM…great combination of ingredients. I have not tried cauliflower in pasta, but that changes here! Definitely want to try this. Looks great. I really like the sound of this, perfect for a busy week. I normally have most of those ingredients in my kitchen! I want to face plant into that pasta dish! I adore cauliflower, this recipe looks and sounds so dang delicious! Gimme Gimme! !